This is a special report, diving deeper into the now 2-year-old wave of political, economic and social turbulence that seems to signal an inflection point to a new, as yet uncertain age. I would love to hear your thoughts. Just hit reply to this email or shoot me a message at steve@axios.com. As public fury in the U.S. has peaked again and again in recent months, it's become clear that the nation is not experiencing a single crisis. 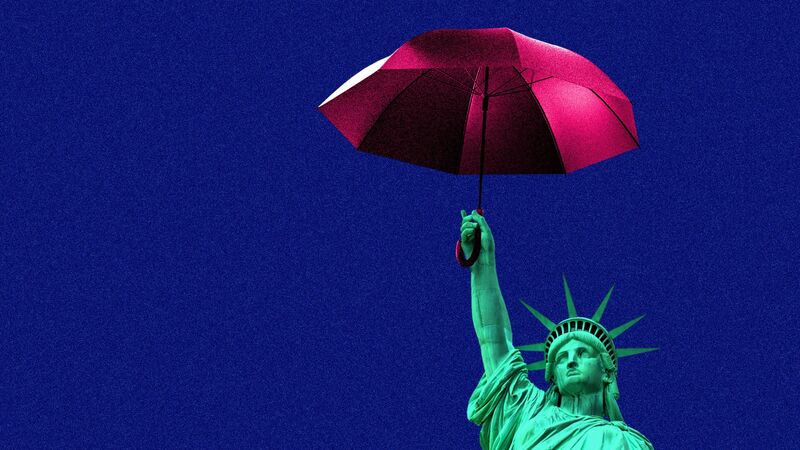 Instead, an angry trio of storms — revolts against immigrants, globalization, and establishment leaders and institutions — are churning independently and of their own logic. Why it matters: The three forces — the same that have been roiling Europe — could go on for decades, experts say. And when they are played out, the West is likely to be a very different world, although it's difficult to discern even the outlines of what may be coming. "There is no going back to the pre-crisis world. The chapter in history defined by globalization, euphoria and singular American dominance is over," William Burns, president of the Carnegie Endowment, tells Axios. Background: The American discontent has been building since the 1990s. In Europe, its origins are more recent. But across the democratic West — in the U.S., Britain, Hungary, Italy, Sweden and more — the two-year eruption of public wrath has been exceptionally volatile and, for those attempting to grasp and address it, vexing. One symptom, says Stanford University historian Francis Fukuyama, has been people reverting to a tribal mentality, perceiving a threat to their status and social culture and lashing out as a response. Though the trio of forces are independent, their simultaneous arrival gives them a combined punch — a virulent threat to the U.S.-led order established after WWII to prevent a new great power war and to create the conditions for broad prosperity. The big picture: None of the crises are flashes in the pan. As we've reported in recent weeks (here, here and here), all three could last years and longer. For much of the time since 2016, many world leaders and others thought — or hoped — that if only President Trump, Brexit or some other person or thing were removed from the picture, the challenge to the existing system would subside. But historians and other scholars say Trump and Brexit are only symptoms of the age. There is no obvious, equally potent counterforce working against them. Adding more to the turbulence, all of this is happening against a backdrop of demographic change in which the developed world's population is aging and shrinking, automation is threatening to wipe out half of all jobs, and the climate is changing. Robert Kagan, author of the new book "The Jungle Grows Back," argues that the developed world appears to be turning back to the more Darwinian rules that prevailed prior to World War II. "It picks up where it left off," he tells Axios. 'America First' has won, by Robert Kagan at NYT. The '60s did not really get going in 1960, nor end in 1969. As we know it culturally, the decade began with the JFK assassination in 1963 and ended only with Nixon's resignation 11 years later. Neither, many historians say, did the 19th century finish in 1899. Instead, it continued until WWI — and even as long as the 1930s. The big picture: Historians call these "long decades" and "long centuries" — super useful constructs for grasping big, prolonged events outside of mere time, and seeing them as eras, zeitgeists and social phenomena. So it is with the 20th century, which as an era appears to have pushed straight through to 2016, when it came to a visible close with the financial crisis, Brexit and the election of Trump, experts tell Axios. Now we are experiencing the foggy, dust-filled interregnum before a still-undefined 21st century, in which all that seems certain is that powerful forces are deliberately working to pull apart what was built. "Trump is the beginning of a new paradigm," says Charles Kupchan, a professor at Georgetown University. Background: The 20th century's defining moment was WWII and its aftermath, producing the long, great power peace, broad prosperity, a decline of poverty and greater health, not to mention the transistor and space travel. Ian Bremmer, president of the Eurasia Group, tells Axios that this epochal break actually precedes Trump, whom he calls a function of the age rather than its impetus. The new age "was coming no matter who the Americans elected," Bremmer says. "It's more about the rise of China, the divisions in the trans-Atlantic relationship and within liberal democracies themselves, [and] the willingness of the Russians to try to exacerbate those divisions." Bremmer thinks the new order won't begin to be decipherable for another decade. That is "in part because these U.S. and European issues need to play out. And perhaps in larger part because, [Chinese President] Xi Jinping notwithstanding, China isn't really ready yet for the global stage." The new world order could have positive aspects, some of the experts we spoke with said. Here are some of their thoughts. "I believe that we could get back to the pre-crisis world and local order in much the way we rebuilt trust and institutions after Vietnam and the 1960s/early 1970s protest movements. It is not inevitable, but if the Western neo-fascists of today and the Chinese and Russian governments overplay their hands, there will be an opportunity to rebuild. Establishing dependable trust in economic arrangements, particularly with respect to U.S.-set standards and to long-term investment, will be slower to rebuild than direct trade and security relationships. In fact, the WTO and trade may go on without the U.S. But the stability and opportunity for developing countries and the U.S. itself will be reduced." "Despite rhetorical panegyrics about the current global system, China seems unwilling or unable to step into the keystone role that the United States has held for decades — offering unlimited access to its consumer base, running structural deficits and accepting international norms of legal and IP protection. It is highly unlikely we relinquish our interest in being a Pacific power as well as an Atlantic power — the unique two-ocean front that makes the United States unusually motivated in everything that goes on across Eurasia. The perpetual undercurrent of U.S. foreign policy remains the containment of any potential trans-continental rival, and China’s rise has captured the attention of U.S. foreign policy, even if the strategy remains hotly debated and unsettled." "There is still a historic window before us, in which American pre-eminence and disciplined leadership can help shape a new world before others shape it for us. This is a transformative moment on the international landscape. There is a greater diffusion of power among states, with the rise of China, the resurgence of Russia and the return of Great Power rivalry. Wider challenges are accelerating, from climate change to the revolution in technology. The United States still has a better hand to play than anyone else. We have advantages not only in military power, but in continuing economic, technological, demographic and diplomatic strengths — and in our capacity for self-repair. Our challenge is to play that hand wisely and not squander our advantages through muscular and erratic unilateralism, eroding the alliances and coalitions that set us apart from lonelier powers like China and Russia." "There are benign scenarios — something like a return to the recent past — and less-benign scenarios. If we think about what events might lead to less-benign outcomes, then certainly we have to consider the possibility of a new Cold War, with the world economy increasingly divided between two competing superpowers, as well as the fraying of the international institutions that have upheld the postwar Western world, notably the European community and NATO, as a result of populist nationalism. These are certainly the trends of the last few years, and while I don't believe in linear extrapolation, I do believe in path dependency — that the actions set in place now are likely to have lasting historical repercussions. Western countries have rarely been so simultaneously divided — and never since World War II. Though the problem looks like toxic politics, it's mainly not. What ails the West, says Stanford historian Francis Fukuyama, is that "people are lining up with their group." What's going on: Fukuyama, whose new book is "Identity: The Demand for Dignity and the Politics of Resentment," says that the anti-establishment revolt is all about people feeling a loss of stature and "agency." In 1989, Fukuyama published "The End of History and the Last Man" — the essay that made him famous. In it, he argued that democracy had proven itself the best and last political system that humans would create. He has faced serious pushback for hubris, especially in the last two years, as country after country in the West has made a decided turn to autocracy. But his detractors have mostly ignored one of Fukuyama's closing thoughts — a prediction back then that (paraphrasing) once people no longer had injustice to fight against, they would fight justice. Fukuyama told me that that is essentially what has happened: "I just think the passage of time allowed people to forget what's wrong with authoritarian governments," he says. "So in Poland, for example, they lived under a Communist dictatorship, but the vast majority of Poles today were born after the fall of Communism. They have no living experience of what it was like to live under a regime like that." But before their populations reached that flashpoint, the people running Western governments opened the door to this forgetfulness by piling on one grave error after another. In that list Fukuyama includes the Iraq War, the 2008 financial crisis and the migrant crisis in Europe. In Europe, the last straw was migrant policy, which large swaths of society perceived as an intolerable attack on what he calls their "credal identity." In the U.S., he says, the Democratic Party crossed the same line by singling out specific groups for special protection "rather than including them as part of the larger group seeking equality." The outcome: populism. "The cultural identity part of it has been underplayed by a lot of people who have focused on the economic drivers of it," Fukuyama says. "The economic drivers are very important, but I think the way that downward economic mobility is interpreted is in terms of loss of status, and that's why it's these former middle classes that no longer feel so middle class, that are the real core constituency for populist movements." The bottom line: There is a solution, Fukuyama says, though for Europe it will be especially hard to get there. Some immigrant communities in Europe, he says, reject basic tenets of the democratic political order. In the U.S., he says, people need to find a path back to a united idea of what it is to be American. "The main message," he says, "is that we need to figure out how to re-create a sense of American national identity that will fit the diverse society that we've become but will still be meaningful in terms of binding us together." Every couple of decades, a new generation of fringe investors tries its luck at pressuring China to make good on bonds issued by the desperate last leaders of the chaotic pre-Communist period. Now, it's a group calling itself the American Bondholders Foundation, which says it represents some 20,000 holders of bonds worth more than $750 billion, based on unpaid interest and capital gains, reports The Economist. Most of the bonds were issued in the early 20th century to build railroads and other infrastructure as Chinese leaders sought to modernize and head off boiling public discontent. There is precedent for both honoring and repudiating debt of ousted governments — Russia, for instance, last year retired the final tranche of $70 billion of Soviet-era bonds, although the prior Soviet government disavowed Czarist debt. Jonna Bianco, who heads the American Bondholders Foundation, is hoping for the former treatment. In August, she briefed Trump on the outrage at his Bedminster, New Jersey, golf resort, asking him to personally take up the case with Chinese leader Xi Jinping. There is no indication about his plans. The bottom line: Claims around pre-Communist bonds — and demands that the U.S. government of the day do something about them — have turned up regularly for decades, including in the 1980s and again in the early 2000s. Now, Bianco hopes to have better luck with Xi.